In the old church youth group campfire song, if memory serves correct, the refrain goes something like this: "It only takes a spark to get a fire going." True in matters of family and faith, it's also true in passing down one of the oldest traditions in all of humanity, the ethical and honorable pastime of hunting, an affair as old as mankind itself. 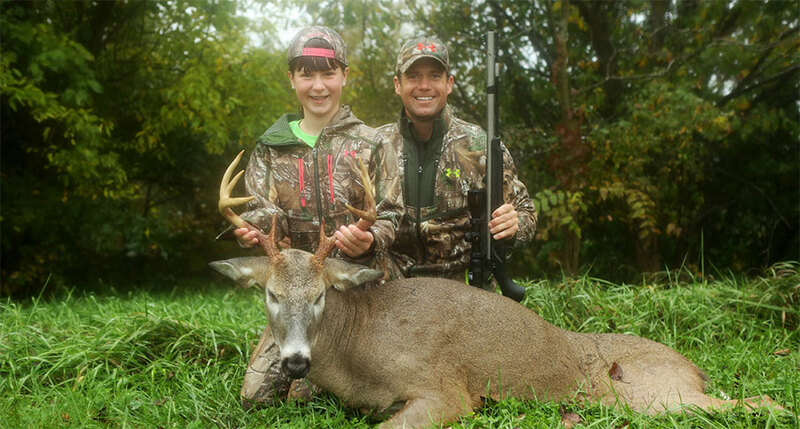 On a recent episode of Outdoor Channel's Hunt Masters television show, host Gregg Ritz does did just that – fan the flames of hunting desire in his daughter's life – as he led her to harvest her first ever white-tailed buck. Part heart-warming, part fun, part adventure and part education, the hunt taught the younger Ritz a lesson in patience. And later on, it reaffirmed the same truth to the older Ritz as Gregg put his own advice to good use in the chase of a buck he’s hunted for several years. For those interested in passing along the flame of hunting to their children, grandchildren or even a child living in the local neighborhood, Ritz was more than willing to share his thoughts on the process of lighting the torch for hunting in a youngster's life. Start Small: "Do not allow kids to shoot too big a gun too quickly," said Ritz. "Make sure (that) the gun is sized appropriately for the child. If possible, start with an air rifle or a .22 caliber rifle." It’s Never Too Early: "There is no magic age to get your kids involved in shooting or in the outdoors," said Ritz. "The earlier the better. My three girls started enjoying archery at the age of five and firearms at the age of seven." Keep It Fun: "Set up targets that are interactive for the kids to shoot at," said Ritz. "You want targets that are fun (to shoot at) and (that) create an immediate response to allow the child to know (that) they have been successful. "One example would be inflating balloons to different sizes to shoot at with your bow and air rifle," he added. "Another example would be the use of spinning and popping targets with your air rifle or .22 caliber rifle, those are ideal (too)." Keep it Personal: "If you have more than one child, try to spend one-on-one time with (each one of) them," said Ritz. "You’ll find that this strengthens your bond with the child as well (and) allows you to be more effective with teaching (them) the basic skills of shooting and the outdoors." Go With Them: "Kids today are captive to their electronic devices, so do your best to unplug them and get them outdoors to explore," said Ritz. "Fields, creeks, woods, parks – whatever you can to (use to) expose them to (the outdoors, it all helps)," he added. "Find a new adventure every month in every season to engage them in the outdoors and they will always learn and see something new. "And (remember this) above all else … a dirty kid is a happy one." It’s something that has undoubtedly been true all throughout the pages of time.